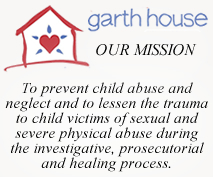 Each agency has a different role in the intervention and investigations of physical and sexual child abuse cases. Prior to the opening of the Garth House, the child was interviewed at several unfamiliar locations. The child would have to recount his or her trauma each time often resulting in unintentional and unnecessary revictimization.